THE SPIRIT OF 99 VIEWING CLUB - Following the death of her son, Manuela goes to tell the sad news to her boy's father, who is living as a woman, amid a heartfelt encrustation of classic Hollywood tropes and references. DID EBERT LIKE IT? 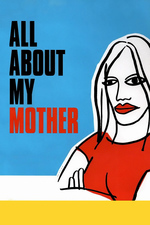 "All About My Mother" is one of the best films of the Spanish director, whose films present a Tennessee Williams sensibility in the visual style of a 1950s Universal-International tearjerker. Rock Hudson and Dorothy Malone never seem very far offscreen. Bette Davis isn't offscreen at all: Almodovar's heroines seem to be playing her. Self-parody is part of Almodovar's approach, but "All About My Mother" is also sincere and heartfelt; though two of its characters are transvestite hookers, one is a pregnant nun and two more are battling lesbians, this is a film that paradoxically expresses family values." Reverse Shot on All About My Mother "In this film, womanhood, on any terms, implies a kind of acting, whereby a person effectively authors herself through performance. " "You're not a person, you are an epidemic!" I've never loved Almodóvar the way I did in this movie. Pitch perfect, sad and over the top, so beautiful.